Arms design "buttons" the arm into place. 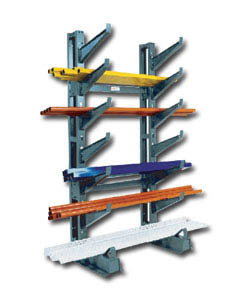 Load with either lift truck or manually. Ideal for efficient storage and organization of pipe, tubing, lumber, bar stock or any long, awkward items. Available in standard single or double column units in 7' and 10' heights. Choose either starter or add-on units, which allows for a complete systems. FOB Shipping Point. Plus Base Cap. Per Unit (lbs.) Plus Base Ship Wt. (lbs.) Price Ea. inclined	 1000	 1000	 6'	 6'	 6-12"
straight	 850	 850	 6'	 6'	 10-20"
inclined	 1000	 1000	 6'	 6'	 12-12"
straight	 850	 850	 6'	 6'	 20-20"